I’ve always been fond of watches. Before there were digital clocks or computers or cell phones, we all wore watches to tell time when we were out and about. I had a few dress watches, a Mickey Mouse watch (when I was in my pre-teen years) and I’m sure a couple I found inside a cereal box) and I wore them proudly. Fast forward to the mid 80’s [or should that be rewind?] I was shopping at Robinson’s one day [before it was Robinson’s/May and way before it got swallowed up by Macy’s] and saw their watch counter. 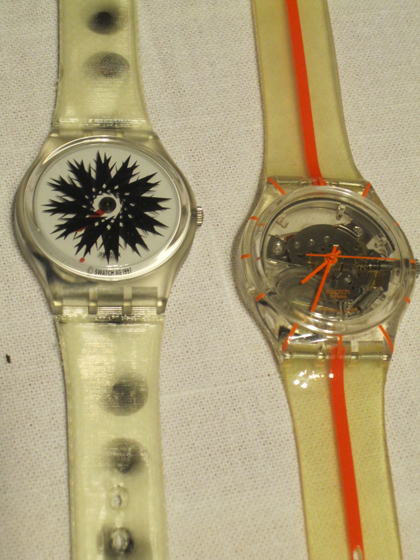 There were these really cool looking plastic watches that stood out from the rest. Bright colors and cool designs, they caught my eye. I had to have one. The photo above are two that I’ve had for at least 20 years. The blue banded one on the right is one of the first ones I got. I had a few others before, but both are in storage as they either quit working or had enough of the plastic break off that they become unwearable. I really loved collecting these, although there was a limit that I placed on myself, otherwise, my collection would be much larger. The other day on Twitter, Becky mentioned a Swatch she had and this sparked my interest to get these out of my nightstand drawer. 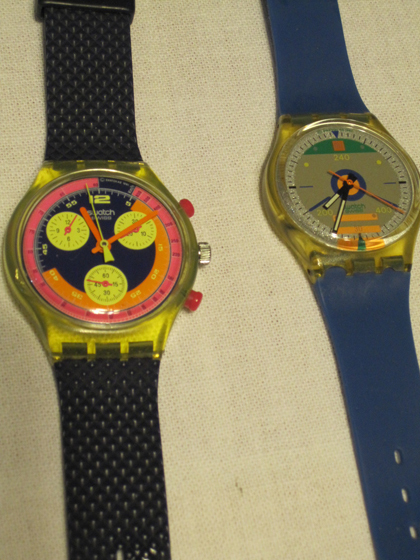 To protect the face of the Swatch, they came out with Swatch Guards. The first was a rubber strap that barely covered the face. I don’t any of those left as they always seemed to break and catch on the hair on my wrist. Pictured above is the guard that offered better coverage of keeping scratches off the face. It’s been years since I bought a Swatch. There used to be a store here in Salt Lake City, but it’s been gone for many years now. Seeing how my interest has been reignited, there may be another purchase here in the near future. Who had a Swatch back in the day? Do you still wear one? Do you still collect? Who DIDN’T have a Swatch? I actually want to get one for my daughter – they’re still pretty cool! 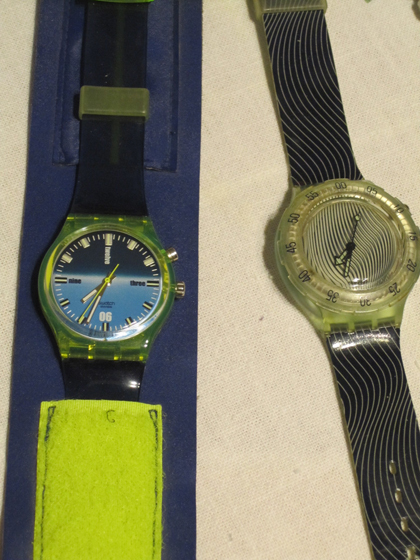 I remember having like, the preppy colors- pink and green, blue and green – I somehow remember rainbows and whales, but I don’t know if they were Swatch watches or not. I knew so many people that had Swatch watches. I liked the bright colors and designs. I loved Swatches! I had several, but don’t have any of my old ones left. At one time I even had a giant Swatch clock that hung on the wall. It was AWESOME! I have no idea what happened to it, but I think it got lost in a move. I remember the giant Swatch. I actually wanted one of those, but was afraid of being labeled a “fan boy” I stuck with just the smaller versions that fit on my wrist. Blimey, I think I owned like 3 or 4 Swatch watches back in the day. I used to love those damn things. 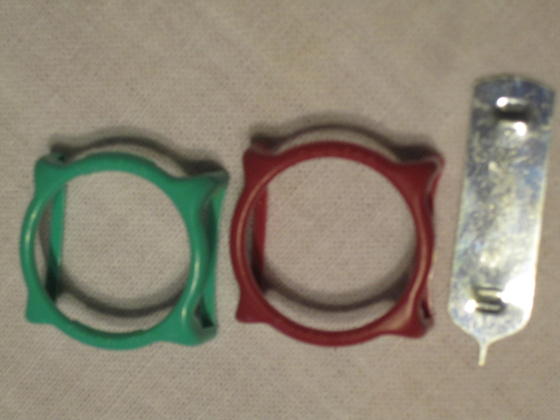 I had one of the big obnoxious wristband ones and everything, strap was almost 3 inches wide . Ah, nostalgia. Ahh. the Pop Swatch. I never cared to own that one, since it was bigger than I wanted to wear on my wrist. I bought one for my daughter, I found them online at swatch.com and here in town at Nordstrom, they are still awesome.